July 25th - 28th, 2019! Hey time travelers! We're back for more shenanigans this year at the Hyatt Aurora and we're excited for what's in store for SwingTime 2019! Make sure to click the Facebook "like" button above to share "Swing Time" on your Facebook timeline! We sold out the Hyatt last year and we're expecting to do it again. Make sure to book your hotel now! If you hadn't heard, we went through a name and an ownership change last year (formerly Swingtime in the Rockies). SwingTime was transformed to give you a mix of the best of traditional WCS and where we see WCS heading in the future! 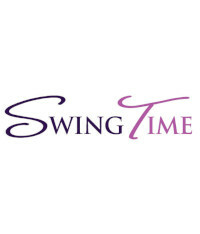 We still offer everything that Swingtime in the Rockies was known for (Classic, Showcase, Rising Star, etc) but we added a bunch of new things! Future Training: Leveled Concept Based Workshops, solo tracks (ex: hip-hop), concept focused intensives (TBA), and workshops for early risers (yoga, dancers stretch, etc). Incredible Social Dancing: 4 nights of WCS social dancing until dawn including two theme nights (past& future), costume contest, and a Zouk social dance room. Traditional& Fun Competitions: WSDC JnJs, Strictlies, routine divisions, one-foot spin strictly, invitational footwork battle, Time Warp Open, and the Switchly Comp (role switching). More details are coming soon and we look forward to going to the future (and past) with you! You're gonna love SwingTime 2019! How do I know that? Because I've already been there and you couldn't stop smiling.